These are the Iconic Syracuse drinks. Follow the series here. We’ll be back next Thursday. If all was right in the world, Burger King and McDonald’s would be second runs in this down. Cars would line up at Carroll’s as they do in California for In-N-Out Burger. If all was right in the world, Poodles and Jim’s would never have burned down in 1975, and there would be a line for every seat in the place. 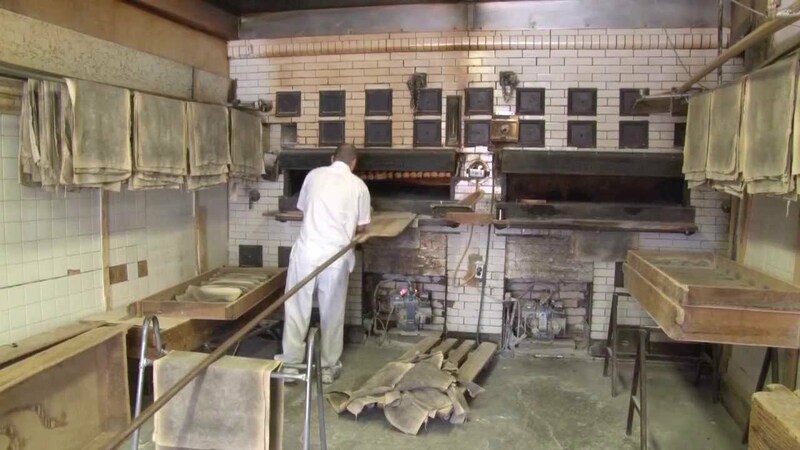 If all was right in our Syracuse food world, the wait at the Dinosaur Bar-b-que would always be 5 to 10 minutes, Columbus Bakery bread would never go stale, and Cafe Kubal would open a location directly across from my office. Twin Trees pizza: There’s New York-style pizza and then there is Syracuse, New York-style pizza. Both have thin crusts, but the Syracuse-style found at Twin Trees locations in the Syracuse area are a little thicker than NYC slices. The sauce at Twin Trees is a little thicker, differing from the lighter New York-style marinara. And, here in the ‘Cuse, these pizzas are cut in strips. Twin Trees is the answer to the question “What is the perfect meal?” It’s great at breakfast (cold, preferably), lunch, dinner, 2 a.m., or after you get home from work and are scrounging for a snack before dinner. Not every Twin Trees is the same and there are slight variances from restaurant to restaurant, but the spirit of the pizza remains the same. Personally, I like the food at Too and III. The In-Laws like the original and III. Hofmann’s Coneys: My cousin, a Syracuse native that moved to Las Vegas 15 years ago (and since relocated to Japan), once ordered a coney during his first-ever visit to a Sonic Drive-In. He claimed false advertising when the carhop delivered a footlong hot dog covered in stuff. Not a coney. In Syracuse, coneys are white hots, a little spicier than the average dog, and made with pork and veal. Hot dogs are hot dogs, and while Hofmann’s German-style pork and veal dogs are great, the white meat coney is something special. Something iconic. And it’s even better when you consume it at Heid’s of Liverpool. Available at Central New York grocers, nationally at Wegmans and Publix stores, and online. 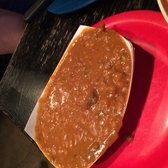 Dinosaur Bar-B-Que Bar-B-Que Beans: There are a lot of Dinosaur Bar-B-Que haters out there. Most complain about George Soros, the billionaire ultraliberal who owns the majority of the chain started by Syracuse native John Stage. Others complain about the quality of food. When the kitchen is on its game (which they are more often than no), the Dinosaur is great. Memphis-style barbecued pork can be found in any city in America, but this is a Syracuse landmark and it deserves representation. Like pulled pork, baked beans are a dime-a-dozen, but the Dinosaur ups the ante with another Iconic Syracuse foodstuff: Gianelli Italian sausage. The result is the sweetness from the brown sugar, starch from the beans and the peppery, fennelly punch of the sausage. 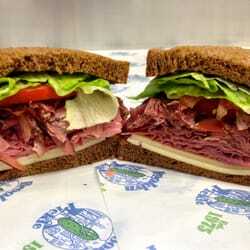 Available at the restaurants and in the refrigerated meat case at Central New York grocers. Frittata: Poodles & Jim’s burned down in 1975, two years before I was born. We would go to Two Guys From Italy (now the Gardenview Diner) on Old Liverpool Road after church on Sunday and have a frittata for breakfast. I remember my father telling me about the Italian egg dishes he ate at Poodles “way back when.” Now a breakfast staple, this was late evening/early morning grease. 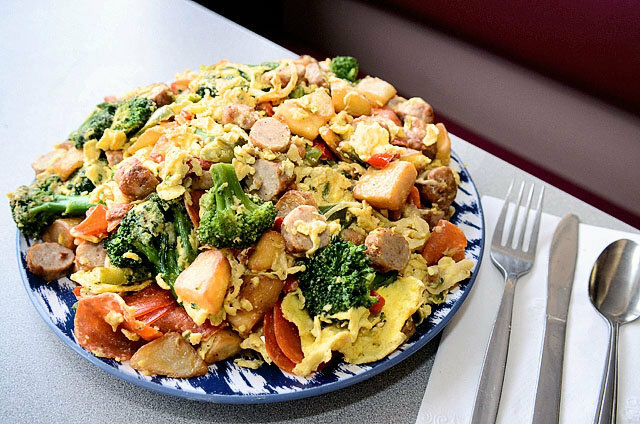 Every diner in Syracuse makes a frittata and everyone has a favorite, but let’s go with the original. Everyone else can just be copycats. Available at every diner and sit-down breakfast spot in Syracuse. My favorites are at Stella’s and Gardenview Diner. Hinderwadel’s Salt Potatoes: I have friends from other parts of the Northeast and mid-Atlantic that cannot believe people from Syracuse beat their chests about potatoes boiled in a ton of salt. The historical context is evident: Irish salt miners would bring bags of small potatoes to work and boil them in the salt brine for lunch. This is as iconic as it gets for this area. Hinderwadel’s gets into the game about 100 years ago, when its owner began serving them at his clambakes and selling 5 lb. bags of potatoes with 12 oz. boxes of salt. They are a staple of summer and at the family-owned event center and seafood market in North Syracuse. Available at most grocers in Central New York and Hinderwadel’s Grove, 5300 W. Taft Rd., N. Syracuse. 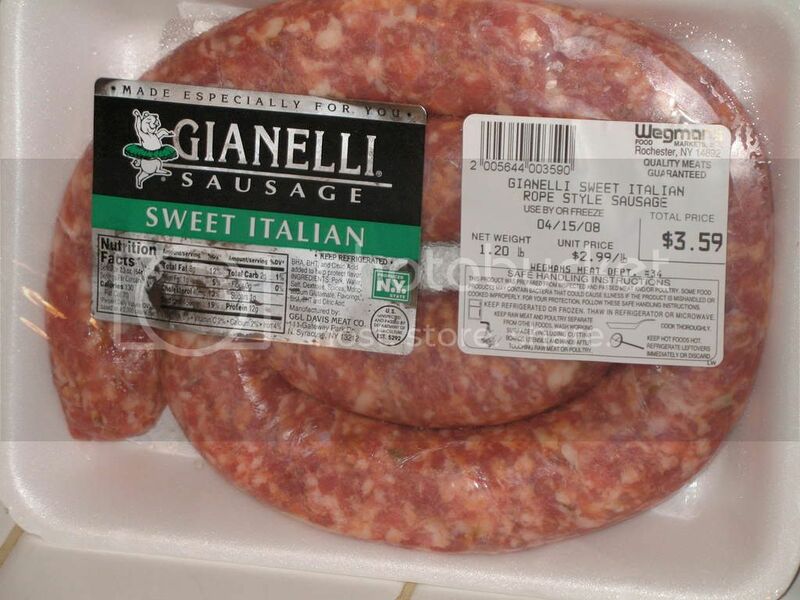 Gianelli Sausage: Gianelli Sausage is my last resort for sausage, which says something about the quality and availability in this area. If I don’t make my own, I would just assume buy it from local butchers like Ascioti’s or Nichols. That said, it’s a huge business that dominates so greatly in this area, so much so that they make sausage on contract for some area supermarkets. Available at Central New York grocery stores, nationally at Wegmans or at their website. Pastabilities Hot Tomato Oil: For years, people on the Syracuse.com food and dining forum posted their guesses at the recipe for the unique blend of oil, tomatoes and peppers found in Pastabilities‘ signature hot tomato oil. The story goes that the owners of Pastabilities discovered it at a roadside restaurant in Italy, and replicated it when returning to the states. For years, it was only available at the restaurant’s bakery across the street, but Pasta’s introduced a shelf-stable version in 2013 and debuted a standalone website where it can be ordered. Available at Pastabilities, 311 S. Franklin St., Syracuse, Pasta’s Daily Bread, 308 S. Franklin St., Syracuse, Central New York grocers, and HotTom.com. Columbus Baking Company Italian Bread: We’ve talked about this before. I believe that DiLauro’s bread is superior in every way. But, DiLauro’s does not have people lined up out front on Christmas morning waiting to buy bread. That’s something special. Polenta Carbonara at The Tyrol Club: TV food chefs embrace polenta as a side dish. For The Wife’s people, the immigrants that moved to Solvay, N.Y. from the Trentino Alto Adige province of Italy, polenta is a three-meal food. A basic polenta uses farina, butter and cheese. A variation, polenta patate, incorporates potatoes for a little more bulk. The Tyrol Club, a social club founded by those immigrants (including The Wife’s maternal grandfather), keeps the culture and link to the motherland alive. Club members used to serve their trademark polenta carbonara at the Solvay Field Days each summer. Lines would form as hungry patrons waited for a car to pull up with the next batch fresh from the club’s kitchen. 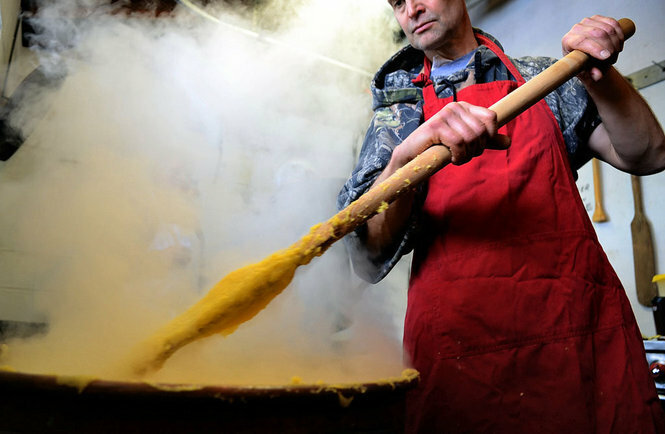 Today, if you want your fix of polenta made the traditional way — in copper kettles called paiolos with paddles called trieses — you have to wait for one of the monthly dinners. Tully’s Tenders: Every bar, restaurant, and children’s menu in America features chicken fingers, but none are quite like those made at Tully’s Good Times. 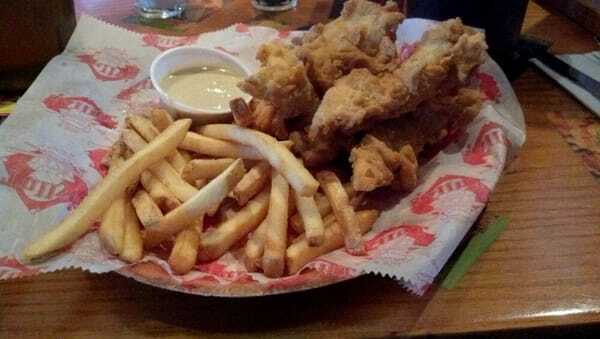 This statewide chain of sports bars, headquartered in Syracuse, chain breads their chicken tenders each day in store. Millions of their chicken tenders have been sold and with reason. Any bar or restaurant can order the prefab stuff from Sysco. The tenders from Tully’s are iconic. The Brooklyn Pickle at The Brooklyn Pickle: My typical order is a roast pork on light rye with mayo, tomato and onions. But, The Brooklyn Pickle’s eponymous sandwich marries shaved corned beef and pastrami with Swiss cheese and Russian dressing on dark rye. If The Brooklyn Pickle is Syracuse’s king of sandwiches, this is their crown. Ascioti’s Meatball Mix: As a child, meatball day in my house was one of my favorites. After measuring out all of the ingredients, my mother would have me jump up on a chair at the island in our kitchen and start mixing by hand. The just-above-freezing meat and egg would paralyze my hand, but the payoff was so worth it. After frying the meatballs, I would spend the afternoon sneaking them from the plate where they were cooling. As an adult, I don’t make my own meatballs. The blend made daily at Ascioti’s Market in Solvay renders that entire process moot. As long as they are making meatball mix, there’s no reason to make my own. Bake at 400 for 20 to 25 minutes or fry until dark brown. Or, during the summer, flatten into a patty and grill it as a burger. There’s a reason this little market has kept going after 100 years. Obviously you aren’t from syracuse as fish fry isnt mentioned. Obviously you aren’t from Syracuse as your IP address shows Washington, D.C. Everyone from Buffalo to Utica does one. A “good” fish fry is not Iconic.